The 2003 spy spoof starring Rowan Atkinson ('Mr. Bean') suiting up on Blu-ray in February has now been fully detailed. As previously reported, Universal is preparing 'Johnny English' for Blu-ray on February 28. He knows no fear. He knows no danger. He knows... nothing! When the priceless Crown Jewels are stolen, bumbling Johnny English (Rowan Atkinson) is the last remaining British spy and the only one who can solve the crime. His prime suspects: a sinister business man (John Malkovich) and a beautiful woman (Natalie Imbruglia) with a mysterious interest in Johnny's top-secret mission. Can the clueless super spy save the day without denting the nation's pride... or his Aston Martin? 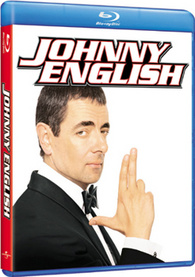 The Blu-ray will feature 1080p video, a DTS-HD Master Audio 5.1 soundtrack, and supplements include: The Making of Johnny English featurette, deleted scenes, character profiles, Spy Tips feature, and Observation Test feature. Suggested list price for the Blu-ray will be is $19.98. You can find the latest specs for 'Johnny English' linked from our Blu-ray Release Schedule, where it's indexed under February 28.